Mental Anguish Is Hurricane's Lasting Legacy In Puerto Rico Town : Shots - Health News Six months after Hurricane Maria pounded Puerto Rico, patience in the remote mountain village of Castañer is wearing thin. Mental anguish persists among people still waiting for reliable electricity. 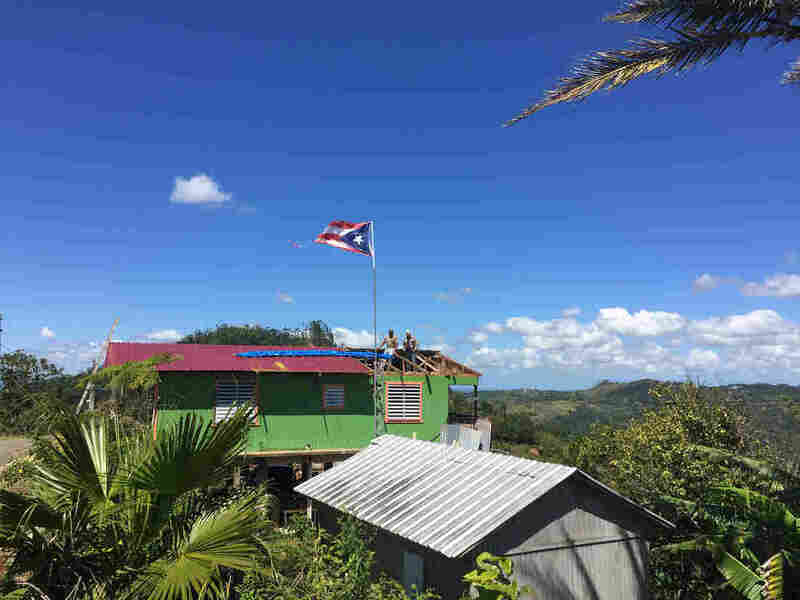 In the aftermath of Hurricane Maria, restorations are being made to a roof in Castañer, a village in Puerto Rico's central mountains. But recovery is slow. Helicopters from the power company buzz across the skies of this picturesque valley, ferrying electrical poles on long wires to workmen standing on steep hillsides. 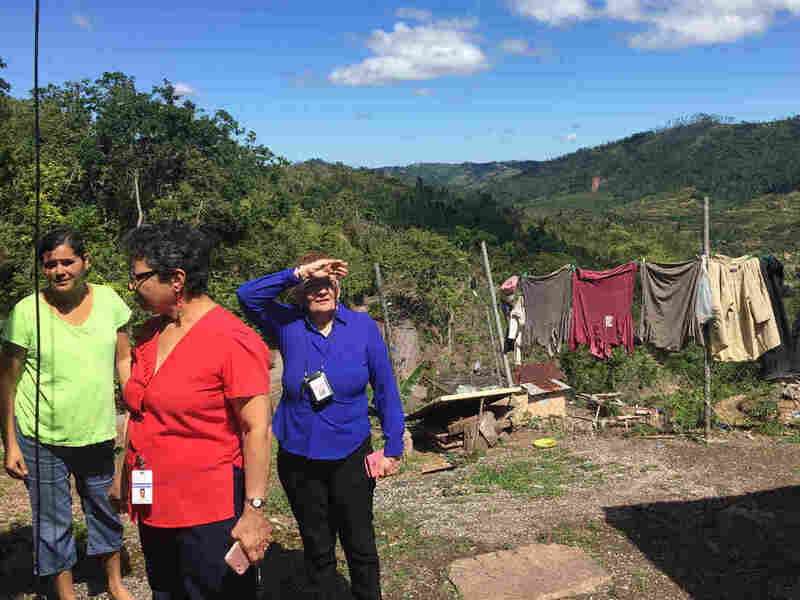 The people of Castañer, an isolated village in Puerto Rico's central mountains, view the repairs to the electrical grid warily. Crews have come and gone, and people living along the mountain roads don't expect to get power until late summer, if ever. Power finally started flowing to the center of town last month, but the grid remains unstable, and the hospital continues to rely on its own generator. The U.S. Department of Housing and Urban Development last week committed an additional $18.5 billion to help rebuild Puerto Rico, and in towns like this the task looks immense. In front of Johanna Garcia Mercado's home in Castañer, the hillside collapsed during the hurricane. Since then, Mercado (left) has had panic attacks and finds herself crying uncontrollably. She has been seeing a psychologist at the local hospital and a social worker makes frequent visits. More than six months after Hurricane Maria, daily life in Castañer isn't close to normal. Children attend school half the day. A nearby school is closed for at least two years, and families who lost their homes have set up beds and couches in its classrooms. The hurricane winds snapped banana trees and ripped up acres of coffee plants here in Puerto Rico's coffee belt. With no harvest this spring, idle men spend hours on the plaza or in the town bar. In the months since the storm, the hospital has become the town's organizing center. From his office there, the hospital's chief executive, Domingo Monroig, looks out onto Castañer's main street, and the entrance to the bar. "They're getting sick mentally. You can see they're not the same. You can see the frustration." "I don't know if the phrase is 'unhappy,' but we call it 'como triste' in Spanish, because it not the same," says Monroig of the mood of the town's residents. "For example, when they have light they are playing in la cancha — the basketball area — or they are in the plaza. But if we don't have light, everybody stays in their home and they say, 'I don't know what to do. It's every day, every day, the same, the same.' "
Many of the town's people continue to experience acute stress and anxiety attacks, says Dr. Javier Portalatin, a clinical psychologist and director general for mental health at the hospital. 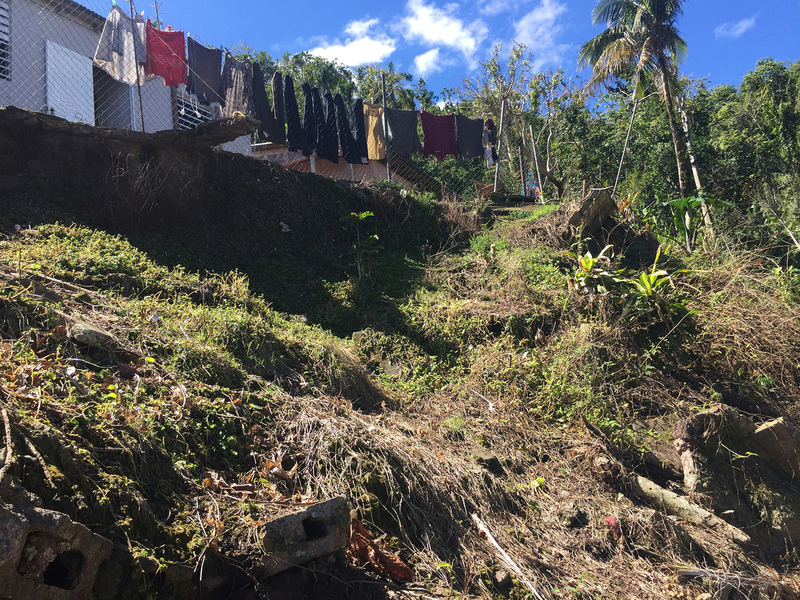 The hillside collapsed to within 10 feet of Mercado's front door during Hurricane Maria, and she was hospitalized for a month afterward. She and her husband still have nightmares with every storm. "Hurricane Georges was in the nighttime, and we only heard the sounds of it," he says, referring to a devastating 1998 storm that hit the island. "This hurricane we saw in the daytime in this region," he says. "We could actually see what was happening through the windows. I have patients who saw their pets being killed and their neighbors' houses destroyed right next to them. These memories spur their anxiety attacks." Up a winding mountain road, one of Portalatin's patients, Johanna Garcia Mercado, lives in near-constant fear. Just 10 feet in front of her tiny, dark home, the hillside collapsed during the hurricane; since then, she says, she feels panic rising in her chest and often cries uncontrollably. "When it rains and thunders," says Mercado, "I'm afraid the steep hillside behind the house will collapse and bury my daughters in mud." She was hospitalized for a month with all the stress. Mercado says she's considered moving, but this piece of land is all the family owns. Her husband worked on the coffee farm across the road. But with no harvest this year, he is digging up yautia roots, which are similar to turnips, and selling them in San Sebastian, an hour away. The villagers of Castañer are working hard to recover, but their resilience is withering. 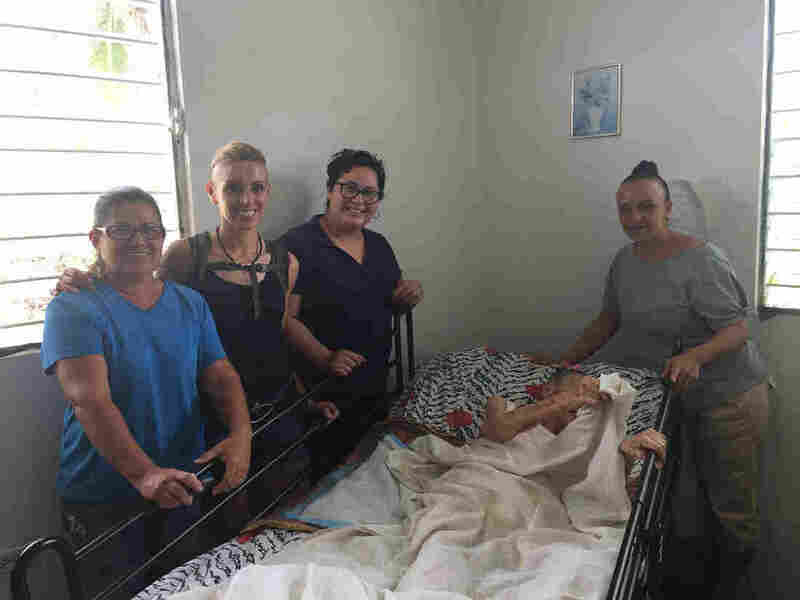 Even Mariela Miranda, a devoted do-gooder who has taken it upon herself to bring food and water to her bedridden neighbors, is starting to lose heart. She delivers hot rice and turkey stew to a family that is caring for a 59-year-old man in the final throes of cancer. The family relies on a small inverter to power the ventilator that is keeping him alive. They have a generator, too, but today it isn't working. "It's been really hard because they need a generator," Miranda says. "His machine has to be on 24 hours for the oxygen." Miranda gets back into the car and heads to her next stop. She's seen case after case of Hurricane Maria's relentless torment: the neighbor sucking for air because he couldn't plug in his nebulizer; the diabetics who can't refrigerate their insulin. (From left) Volunteers Shelley Guerra, Melissa Torres and Mariela Miranda, and caregiver Dalia Marys, surround 109-year-old Virgenia Mendez, who has Alzheimer's. When Mendez' home lost power for four months, her medically prescribed mattress no longer inflated, and she developed bedsores. She even helps a 109-year-old bedridden woman with Alzheimer's who had terrible bedsores after lying on a medical air mattress for four months that couldn't be inflated because her home had no power. "They're getting sick mentally," Miranda says. "You can see they're not the same. You can see the frustration." Even after the power comes back on, Miranda says, her elderly and bedridden neighbors will never fully recover. "If the light comes back they will still have the mental damage, like they were like abandoned," she says. "This gets to you," she continues. "It drains you. You get so frustrated sometimes. Because there are people that will die." She recalls an elderly man she used to visit who died a month ago. "He died because he had [sleep] apnea and he didn't have the power," she says. "So every night he would sleep at the macasina — in the driveway. He would sleep in the driveway, sitting on the couch, because he was scared to die if he fell asleep." When I ask her who should lead the effort to restore daily life to Castañer, Miranda grows exasperated. "We hear the help is getting here," she says, "but those of us who visit the houses? We don't see it." At the Mission La Santa Cruz church, the Rev. Edwin Orlando Velez Castro prepares for Friday night services. Most of the townspeople, he says, were baptized here. Standing in the darkened chapel — there is no power here either — Castro says song is like a prayer to God to change life and make it new. "Most of the hymns we sing in this time give people faith that God will help us rebuild ourselves and our town," he says. "That is part of our mission — to be light in this darkness."